Lymph nodes are intricately involved in your body's immune response, contributing to your ability to fight off infections. Located in various regions of your body -- including behind your ears -- nodes fill with fluid when you are exposed to a bacteria or virus. If your infant or young child experiences swollen lymph nodes, they may have been exposed to a pathogen. 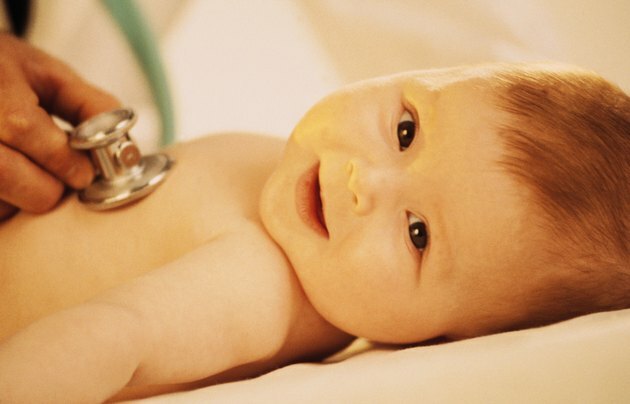 Contact your pediatrician for instructions and treatment options. The lymphatic system is a network of vessels that carry a clear fluid called lymph, which contains protein molecules, salts and other substances, throughout your body. Acting as a drainage system, lymph vessels collect extra lymph fluid that leaks from body tissues and returns it to the blood. Without this process, the lymph fluid will cause tissue swelling. Bacteria and viruses are also drained out of cells and tissues through lymph fluid. Germs are filtered out in lymph nodes, which contain lymphocytes -- a type of white-blood cell -- to trap and destroy harmful invaders. Lymph nodes are palpable, or able to be felt, and are typically less than 1/2 inch in diameter. During an infection, nodes may swell to over twice this size, according to Seattle Children's Hospital. Nodes that are 1/2 to 1 inch in size are indicative of a viral infection, while nodes greater than an inch in diameter are associated with a bacterial infection. Nodes in the neck and behind the ears are most often affected during childhood illness because of the respiratory infections that commonly affect children during this time. You may see or feel swellings behind the ears and along the back of the neck or under the jaw. Swollen lymph nodes alone are not contagious; however, a potential infection is contagious. Accompanying symptoms like coughing, fever, irritability or a runny nose give greater clues as to the source of the infection. Lymph nodes can be painful, and the overlying skin can appear red. Swallowing and breathing can become impaired in certain cases. Contact your doctor within 24 hours if a node is tender and 1 or more inches in size. If a fever is present or your child's movements are hindered by the swollen nodes, alert your physician. Treatment involves treating the underlying causes. If the infection is bacterial, your doctor may prescribe antibiotics. Viral infections do not respond to antibiotic treatment, so over-the-counter, anti-inflammatory medicines may be recommended by your pediatrician.